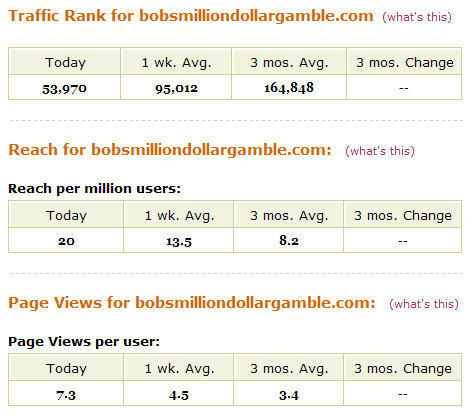 Here is a snap-shot of the visitor stats for www.bobsmilliondollargamble.com upto the 23rd March 2006. We have received over 5 million hits and 97,000 unique visits this our 'launch month'. All stats quoted are verifiable. For as little as $10 you can expose your website to this traffic. Read the press coverage to date. What have you got to lose? We will continue to update stat information here. These stats are taken directly from our server log. You decide if Bob's pixels are worth buying or not. To give you an idea of our rapid success to date since our recent launch, below you can see our world traffic rank on Alexa.com for Sunday 26 March. Convinced? I thought so! For as little as $10 YOU can buy space now. If you followed the Million Dollar Homepage story you will understand this is a chicken-and-egg type question. Were the pixels on the MillionDollarHomepage.com worth buying? Of course they were - the site became the hottest website in the world fact. Why? Because the first few advertisers to buy pixels started a very large snowball effect. All who followed the MillionDollarHomepage.com will no doubt have read the Sponge New Business story (testimonial) - they spent $100 and immediately their business 'exploded' with over £18,000 ($31,000) of new business leads as a direct result of that $100 in the first week. The actual size of their ad’ on the MillionDollarHomepage.com?... ....! In fact, the only people who 'lost' as a result of the MillionDollarHomepage were the people who sat and watched and sat and watched and sat and watched and did NOTHING. Are you thinking 'cool, but I haven't got a website'? click here and learn how you can set yourself up to start earning money only 15 minutes from now. 'The chicken-end-egg' comment simply means that if no one buys pixels here interest will just die like Darth Vader in Star Wars. However, if advertisers take up the 10% pixel-holiday and the grid fills fast - then global interest will also explode. After all - the interest in Bob suggesting he will 'leave' the MillionDollarHomepage - will generate huge interest anyway. You can also help Bob by telling 5 friends with a chance to win $1600 worth of space. Someone will win. You can also order pixels now. If you take up the 10% pixel-holiday period early enough you will have more time to judge for your self the benefits. Bob himself spent a one off $100 on the MillionDollarHomepage.com and I can honestly say it was the best $100 he ever spent. If everyone sits back and thinks - I'll wait and see what happens - NOTHING will happen. It's not rocket science! Buy the pixels and make it happen: as the grid begins to fill we will see a trend nearing exponentiallity occurring. And don't forget your pixel space can be yours for 10 years - or you can receive offers for it in the future. Once the pixel homepage goes live Bob will be happy to receive testimonials from advertisers. You will be able to read them here. Want to get TRAFFIC? Want YOUR testimonial here? Get your 10% pixels now – order pixels for Bob.